Are you looking for a top-quality nanny cam? Then this alarm clock with camera should be at the top of your list. Read our buying guide packed with information to help you decide if it’s the right one for you. Are you suspecting that your child is not studying his lessons or not making his homework while inside his room? If you are, there’s one device that can help you find out the truth. The Alarm Clock Radio HD Spy Camera can capture your child’s every move without him noticing it. This spy camera looks like an ordinary alarm clock and is guaranteed hidden so no one at home will ever think you are monitoring every event taking place there. When you place this on top of his side table beside the lampshade, your son or daughter will think you just bought something to ensure he or she wakes up right on time. You can take hours and hours of monitoring with this covert security camera. With the 16GB microSD card that comes with the package, you can document many different high-quality photos and videos for your review later. Definitely, there’s no way any member of the family will discover that there is a security camera inside the room. This is simply because this radio clock camera functions mainly as an alarm clock. The best hidden cameras are the ones that are hidden in plain sight. While you can opt for something like a mini camera, you’ll have to hide it well to make sure that nobody notices. We generally recommend something like this alarm clock, USB charger, smoke detector camera, or light bulb camera. That’s because these things can normally be found around any home or business. What room doesn’t have a lightbulb in it? Or what house doesn’t have a smoke detector. Finally, you can easily find a USB charger around any place where cash transactions might take place such as near a cash register or front counter. What do People Think About this Alarm Clock Nanny Cam? If you want to make sure your child is really doing his school work and not sleeping, position an Alarm Clock Radio HD Spy Camera inside his bedroom. This will make him think you just bought a new alarm clock for him so he won’t be using his cell phone anymore to wake him up. Even though this secret recording device is a bit pricier than the similar devices on Amazon, this is definitely worth your money. This innovative product has motion detect recording too, to ensure longer time for recording for you. And since this a plug-and-play thing, you can easily connect it to your TV or PC to review the recorded files. More file are safely stored in the 16GB microSD card that comes with the package. Meaning, you won’t miss a single movement or activity of your child even if you’re not home. The Alarm Clock Radio HD Spy Camera is lightweight and compact. Therefore, you can also bring it with you to place on the table or on top of your desk in time for a meeting or discussion. This will help you remember the things discussed especially if you are not too good in taking notes using pen and paper. Isn’t it worth your money? Or, you can keep an eye on your nanny or housekeeper to make sure that your home and children are safe. After all, what’s more important than protecting the people and things you love? Why don’t you head over to the Amazon page now, check out and purchase the Alarm Clock Radio HD Spy Camera? 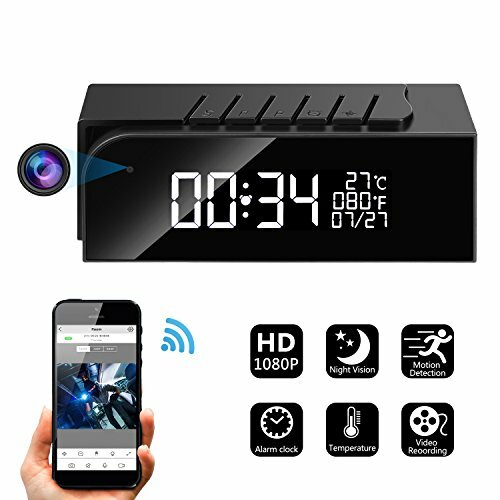 What are your thoughts about this popular clock radio nanny camera? Leave a comment below and let us know what you think. Or, do you have another top pick for spy camera? I was just checking out this alarm clock over on Amazon, and wanted to see what the deal was. Thanks for the details. I’ve been looking for something to see what my babysitter is up to when I’m not home. Thanks for the review. Thanks for the tips about which brands work well.